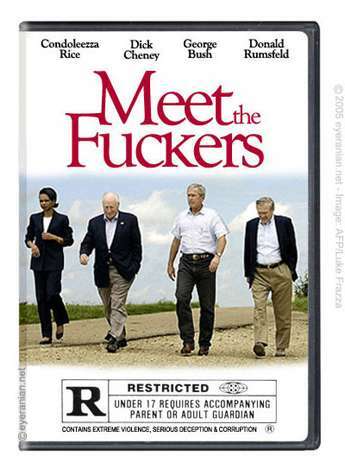 As long as there is a Bush in the White House, there won’t be a lack of ideas to write about. 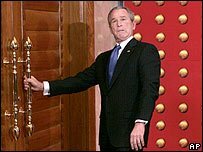 Dubya does it again… this time, an attempt to create a Free Trade Deal with Latin American countries. For their benefit? I doubt that very much. Also doubting it was Fidel Castro of Cuba, Evo Morales of Bolivia and Hugo Chavez of Venezuela. 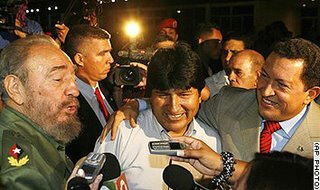 The three Socialist leaders of Latin America came up with a counter agreement, one that will benefit each other, not attempt to control as the Bush agreement would have. 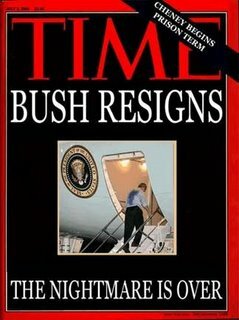 Read about it here,,,, All power to those who stand up against Dubya! They have nothing to lose but their chains!! So looking forward to this issue of Time…. Thanks DustyDoggie for posting it. To watch a video of the pact signing, click here. First reports are that tens of thousands of New Yorkers marched today to end the war in Iraq. Hopefully those that participated will comment here with details. CNN was late with their report, but it is a good one. Organisors claim that 300,000 took part in the march. Last summer, during the evacuation of Jewish settlers from Gaza, many questions were raised. One was, Why can’t Jews remain in Palestine? Another was, why don’t the Palestinians like us? There are no simple answers to these questions, decades of wrongdoings have caused much distrust on both sides. This article from HaAretz shows why it will take a long time for attitudes to change. These settlers will scream obscenities at the Israeli soldiers when they too are removed from the illegal settlements they live in. They will also become a burdon on the Israeli taxpayer as they are put up in five star hotels until they find suitable housing. It seems that no one likes these people, not only the Palestinians. Residents of the West Bank settlement of Maon, located in the southern Hebron Hills, renewed their efforts on Saturday to prevent Palestinian children from traveling to and from school. The IDF and police provide security jeeps to accompany and protect the children. However, the children’s parents have been attacked on four separate occasions in the past week while trying to protect facilitate the travel. Large police and army forces were called to the scene, but it took close to an hour before a path was cleared to allow the jeep, with the children, to continue on its way. None of the passengers of the jeep were injured. Immigrants in the United States are fed up with being treated as second class citizens, even more fed up with being denied citizenship. Mass demonstrations have recently brought their plight to the public’s eye. Their ‘movement’ is gaining strength daily and is now upsetting the top brass in Washington. Yesterday a group presented for the first time a Spanish language version of the Star Spangled Banner. If you click here you can read about it. Click on the audio box in the article to hear the words to the song… it’s quite lovely. 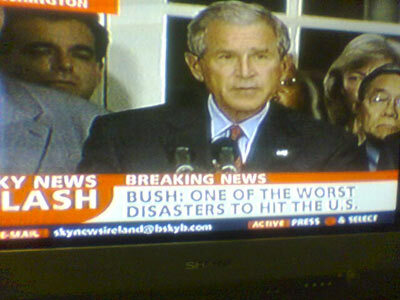 Quite amusing was the reaction of Dubya, when speaking of the new song. 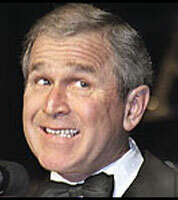 His words were…”And I think people who want to be a citizen of this country ought to learn English,” Mr. Bush said. 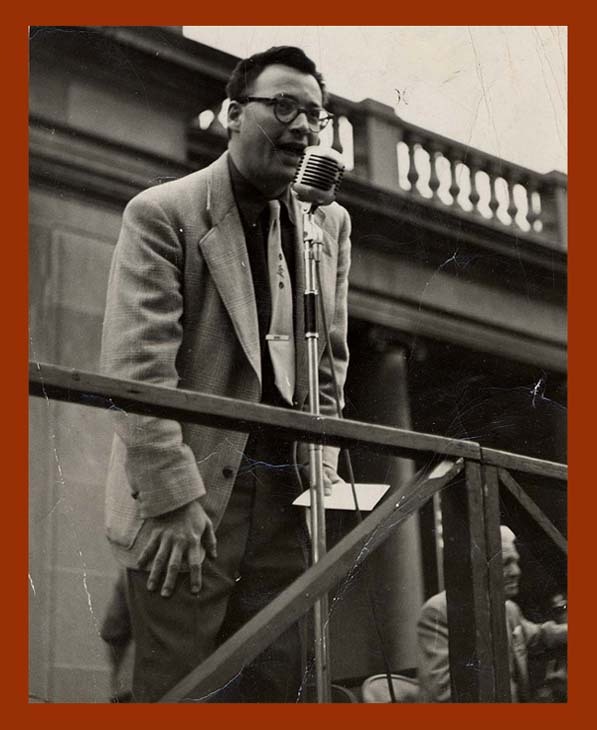 “And they ought to learn to sing the national anthem in English.”…. Don’t you agree that he might set the example? 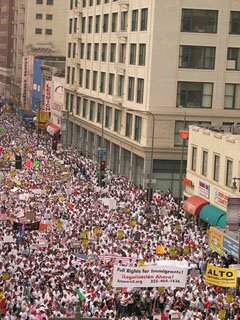 This, from the CNN report…”Millions of workers, men and women without documents and their supporters who are, in fact, legal United States citizens will heed the call to not go to work,” said Juan Jose Gutierrez, national coordinator of Latino Movement USA and one of the lead organizers of Monday’s planned boycott. Boycott organizers are demanding amnesty and the chance for the estimated 11 million to 12 million illegal immigrants in the United States to earn citizenship. Gutierrez compares their struggle with that of American colonists against British rule more than 200 years ago. All in all, it promises to be a very challenging day for the Administration. The demonstators will hopefully get the support of most of organised labour. A victory for them will surely be a victory for all. This May 1st will be the 120th anniversary of the first May Day. A Holiday born in the United States of America, but officially celebrated in most countries EXCEPT the United States. We are being watched…. so you better watch it! C’mon guys… don’t let me down on this one. There are just a few weeks left for Dusty to get to her goal… please help make it happen…. PLEASE. This is a repost… It’s really important to me. I ‘lifted’ this thread from the blog of a very dear friend and one of my links DustyDoggie…please read it and help in any way you can. Don’t let this guy get away with the crimes he is committing daily. Get ready to demonstrate against his war this coming Saturday… it’s a matter of life or death! In the meantime, you can kick him around for a bit to get rid of your frustration with him. Click here and enjoy…. use your mouse to get him good! In a truly diplomatic manner, Hamas today rejected the message that AlJazeera broadcasted from Osama Bin Laden yesterday. Hamas and a Sudanese rebel group have distanced themselves from a statement from Osama bin Laden condemning the West for its actions in both countries. The above were the words that headlined AlJazeera’s report on the situation. This is a time when both Israel and Palestine must make every effort to bring the prospect of negotiations and recognition of each other a reality. I applaud the leadership of Hamas for making this decision and hope that the Israeli government will see it as a sincere move towards a peaceful solution of the crisis. 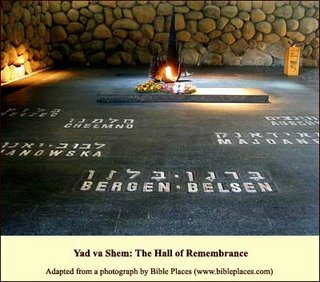 Tomorrow evening at sundown, Jews throughout the State of Israel and the world will observe a moment of silence for the 6 million Jews that perished in the holocaust. Tuesday, until sundown, observances will be held throughout the land with a siren blowing at 11 A.M. All traffic comes to a halt as millions of citizens stand at attention, in silence, for 60 seconds. The day is known as Holocaust Memorial Day (Yom Ha’Shoah in Hebrew).We must never allow any nation to repeat those crimes against any nation. Memorial candles are lit traditionally in memory of the victims. I ask that you, my readers light one as well and include in your prayers all those that have died since the holocaust as a result of hatred and racism. They too deserve our rememberence. The evil deeds against humanity in those days must never be forgotten, nor must they ever be forgiven for the crimes commited. The photo above is the Sanctuary of the Holocaust Memorial Museum (Yad Vashem), in Jerusalem. The flame is eternal, as must be the memory of all those that perished. There has been much criticism of the man lately, but his true nature is often overlooked. In all fairness, I think we must show the true, human side of the man America knows as the Commander in Chief. George Bush – He’s the DECIDER (in describing himself at a press conference last week when asked if Rumsfeld should resign). Now here’s a great take on that nickname he’s given himself. John Lennon would have loved this, don’t you think? Click here to hear the song for yourself… it’s really worthwhile. So, if you’re really fed up with him and his team, next Saturday would be a good day to start demonstrating against him and his war. What do you do if you leave an area that you occupied illegally for years only to see the inhabitants elect a government express their anger and concerns over those years? What do you do instead of sitting down to negotiate with that new government? If you are the Israeli government that just received a mandate to further pull out of the occupied areas you literally screw both the Israeli and Palestinian people by considering to reoccupy the one you just pulled out of. Politicians are deadly and frightening…. we need representatives throughout the world that care about their people… not their jobs! Israel will reoccupy the Gaza Strip if Hamas does not put an end to cross border rocket attacks, a senior military commander says. Major-General Yoav Galant, head of Israel’s southern command, said he was considering a range of options, including the possibility of re-entering Gaza. Galant told the Maariv daily on Friday: “We’re talking about more aggressive military activity. If the price we have to pay becomes unreasonable as a result of increased (Palestinian) attacks, then we shall have to take all steps, including occupying the Gaza Strip. 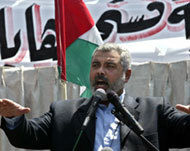 He said his plans had already been approved by senior officials, including Shaul Mofaz the Israeli defence minister. The Haaretz newspaper quoted senior army commanders on Friday as saying troops were being trained for an offensive in the Gaza Strip as part of contingency plans the army had drawn up. But the newspaper quoted the commanders as saying such an operation was unlikely to be implemented in the near future as it could undermine international backing for Israel since Hamas took over the Palestinian government on March 29. Galant said: “I wouldn’t want to reach that situation, but if it’s forced upon us we have a plan to occupy the strip. An army spokeswoman said 300 rockets had been fired into Israel since Hamas won a January 25 Palestinian election compared to 100 rockets fired in the five months between September and late January. The homemade rockets cause panic but few casualties. Dan Halutz, Israel’s army chief, preferred airforce missile strikes against militants in Gaza as well as artillery fire on areas near the Gaza-Israel border used by militants to fire rockets into Israel, Haaretz said. 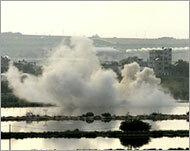 The strikes on Gaza have killed 20 Palestinians, mostly militants, since the start of April. Among them was a seven-year-old girl killed when an artillery shell hit a house in the northern Gaza town of Beit Lahiya. Haaretz quoted an army officer as saying the break in security co-ordination between Israel and the Palestinian security forces since Hamas’ rise to power had eliminated a mechanism for resolving problems without violence. “There is no-longer anyone to mediate during a flare-up, neither the Egyptians nor the Americans. Consequently, they speak with Qassams (rockets) and we respond with 155mm shells,” it quoted the officer as saying. Israel withdrew from Gaza last summer, ending 38 years of military occupation and is reluctant to go back after spending millions of dollars to withdraw and overcoming staunch political opposition. In addition, Israel is pleased with the international pressure on Hamas and fears military action could jeopardise that. Although Hamas has been observing a truce with Israel for more than year, it has said it will not prevent other groups from carrying out attacks. Hamas said a suicide bombing in Tel Aviv this week was justified. Israel says it holds Hamas responsible for the violence, though it is holding off direct military action against the group for the time being. Although war is not a laughing matter, this cartoon that I found in this new underground Canadian newspaper is quite amusing. Despite that, everything humanly possible must be done to end the war in Iraq NOW. Americans will have the opportunity to demonstrate against the war next Saturday, the 29th of April. Scroll down to read my thread about that demonstration. I hope all of my readers that can, will be there. I expect to see some great press coverage of that demonstration…. In the meantime, here is a good laugh at a non-laughing matter.. THIS message makes more sense. 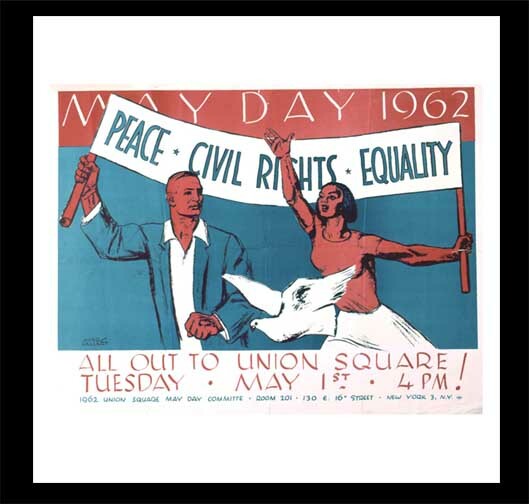 Looking back at my involvement in the ‘Movement’ throughout the 60’s, I always think back to the role music played in our demonstrations and rallies. We had the best artists on our side it seemed and their songs still carry a valid message to the struggles of today. 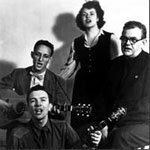 The most popular group was one called the Weavers. They were truly the greatest. Their songs are still sung today by progressives throughout the world, their message lives on. They were remembered in an article today in the Jewish newspaper the Forward. Hopefully the fact that they are remembered also means that the millions of people involved in those days are also remembered. We had a good cause, we put up a good fight… and it ain’t over yet! There was much said in the western and local press about the suicide bombing in Tel Aviv this past Monday. Most of the articles look for a party to blame, rather than talk about what happened and why. There is an organisation in Israel called Gush Shalom, their outlook on the situation is very different than that of the mass media. The following dispatch is from their office, read it and get another perspective of the situation. Sure, we are horrified by the senseless random killing. But we have also something to say about why it happened, how it might have been prevented, how the next one can still be prevented. But how to say it on this day and in that location? How to make comprehensible, to shocked and angry and traumatized people, that the occupation is the root cause of our suffering as well as the Palestinians’? How to explain convincingly that we must dry at source the oppression which makes young Palestinians don explosive belts and throw away their lives together with those of others? The flood of news reports continues. The number of fatalities has grown to nine, and doctors at Ichilov Hospital are still fighting to save the life of a very severely wounded sixteen year-old boy. At least two of the women killed were foreign migrant workers, and the Israeli consulate in Romania is trying to locate the family of one of them. The following is a piece that appears in yesterday’s issue of HaAretz. I personally do not agree with it 100% but it is definitely worth the read and does raise some interesting questions. In fact, there is nothing that enemies hate more, than to be told that they are alike. Since it’s Pesach on our side, it might be the right time to bring up the central obsession of both Jewish tradition and Palestinian culture: exile, and the hope for return. It was the experience of exile that forged the Jews and the Palestinians both. We are who we are, in no small part, for the hardships and longings and insecurities that displacement from home confers. The story we are commanded as Jews to tell on the seder night has everything to do with exile and its curses, the pain of the loss of freedom, the humiliation of the loss of humanity and choice, the fear of loss of collective memory, the strife – much of it self-imposed – of seeking redemption through return. So crucial to us is the experience of exile, that every week we cite the exodus from Egypt in the Sabbath kiddush, in the same breath as the very creation of the world. Certainly, for Palestinians, exile exerts no less commanding a power over the national personality. 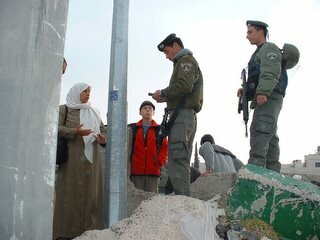 For many Palestinians, the issue of eventual return home of refugees is the one question before which all other Israeli-Palestinian disputes pale. Palestinians the world over treasure the keys to former family homes in the Holy Land, many or most of which may no longer be standing. On six continents, Palestinians and Jews, awash in the alienation of diaspora, dream of an ancestral home so idealized that it may well never have existed. The insecurity of the refugee stalks all of us. It is in our blood. We all suffer from it, Jew and Palestinian, even as we deny the right of our enemy to suffer, even as we blame our enemy for his own suffering. For the Jews, the insecurity manifests itself as fear, fear of being annihilated, fear of being cast out of here by force. For the Palestinians, the insecurity finds expression in humiliation, a profound loss of honor that stretches over the decades that the state of Israel has existed. Our fear is such that the very steps we take to protect ourselves – at checkpoints, in airport searches, in wall-building, in military raids – only deepen the humiliation of the Palestinians. Their humiliation is such that the very steps they take to redeem themselves – suicide bombings, drive-by killings, Qassam salvos, masked paramilitary posturing – only serve to deepen our fear. Then there is the refugee’s ultimate weapon, one that figures in the arsenals of both sides. It is the wily stubbornness that is the child of the union of memory and rage. In the Jewish refugee it is as old as Joseph in Egypt. It is called the trait of a stiff-necked people, a people who will even stand up and defy God if they so choose, and the trait has been ours since the Exodus. In the Palestinians it is called sumud, or steadfastness. It is a trait that makes Palestinians defiant, rather than compliant, as we throw shell after shell at them. It is this trait that makes victory impossible here. We will literally die to deny our enemy a victory, and our enemy is certainly prepared to return the favor. So it is, that more than half a century of conflict has done little to change the lot of refugees, except to create more and more of them. It was perhaps more inevitable than ironic, that the creation of the state of Israel, born in large part to solve the refugee catastrophe in the wake of the Holocaust, gave rise to new refugee catastrophes. The wars in 1948 and 1967 sparked the Palestinian refugee problem, and also spurred the exile of masses of Jewish refugees from Muslim lands. It might be said that all members of a people are refugees, until all of their refugee brethren are able to come home. No peoples on this earth have more experience with the status of refugees than do the residents of the Holy Land. And no two peoples on this earth have a greater problem with finding a way to solve their refugee problems. Over the past year, we in Israel ceded the Palestinians an amount of territory which, in the space of six days, gave them rule over an additional 50 percent of the total territory they comtrolled in the Gaza Strip. In the process, we created another 8,000 refugees. 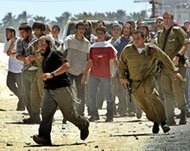 We expelled the Jews of Gush Katif, northern Gaza and northern Samaria from their homes, and then we failed them. We have yet to be able to see to their needs. This alone may delay for years and years the plan to create 70,000 more Jewish refugees in the West Bank. The war in the territories continues to create Palestinian refugees as well, people, whose houses we demolished for various reasons and in various ways. It’s a matter of time, and the extent to which all of us can stand to continue to be refugees. We are, all of us here, Jew and Arab, victims of our refugee mentality, the one we cannot shake, the one that makes us into villain and victim both. We are, all of us, still dor hamidbar, the Generation of the Wilderness, still adrift in our dreams, still holding on, still holding out for dear life, unwilling to part with the refugee’s fervent illusions about how this eventual state of ours should look. Of how it must look, in order to somehow justify and give meaning to our decades and decades of suffering. For many on the Palestinian side, it is preferable by far to hold out and hold on to the illusion that all will return to former homes, than to have an independent Palestine that confirms the compromise, and thus, the defeat. For many on the Israeli side, it is preferable by far to hold out and hold on to the illusion that we can keep all of our bibically deeded land, Shilo and Shechem and Beit El and Hebron, than to live within the real, internationally recognized, final borders that define an independent state. In the process, though, we are disheartened. We are ground down by the burden of being permanent refugees. We are ground down by living in this place of colossal disappointment. 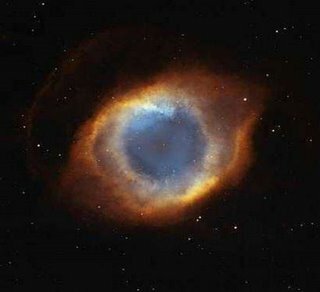 We are ground down by the ways our brethren disappoint us, either because they do not share our vision for the eventual state, or because their actions make the vision in our heads that much more unreal, that much more distant. We know the price of living together, what it would cost to part our peoples. The price is still too high for us, Arab and Jew. The price is nothing less than the death of our incompatible dreams, at root, the idea that one of our peoples can have all of this all to itself, river to the sea, Jerusalem and its sacred heart. We will all of us here, Jew and Arab, be refugees until we can bring ourselves to accept that the other has rights, legitimate grievances, and valid claims. We cannot have a truly independent, viable, Jewish state until our borders and our capital are recognized by the world community. With the Palestinian issue unsolved, we cannot even convince our closest ally to recognize our capital city. We are not yet independent. As long as we are in a state without borders, we remain stateless ourselves, internal refugees, in limbo at home. Our enemies the Palestinians have a similar problem. They will not be free of the curse of the refugee soul until they can relinquish the idea that respect can only be gained through the barrel of a gun. If the Palestinians can someday put aside their honor issues long enough to stop firing rockets and exalting holy resistance as a sacrament, Israel will withdraw in the West Bank, and a state will arise. Sooner or later, there will be two states. Even the extremists know this. If they didn’t, they wouldn’t have to work so hard to prevent it. It’s a matter of time. It could take another 20 years and terrible trauma, but it will happen. Until then, we’ll all continue to be adrift. Mired with one another, and with ourselves. Refugees, right here at home. I call the period between Passover and Israeli Independance Day the days of “In Your Face”. Why???? It’s the start of the flag waving days. Israeli flags appear on autos, homes, all public streets, and remain there for about a month. This is an annual happening. I’ve lived in three countries and have never seen anything like this anywhere else except perhaps on July 4th in the States and July 1st in Canada. But here in Israel, it’s for a month. I’ve never been a flag waver and to tell the truth, I find it rather offensive the way it is done here. It seems to be the Israeli way of saying to the Palestinians, “We have a State and you don’t”. It is truly an ‘In your face’ kind of thing. Another ongoing ‘in your face’ thing is the continual harrassment of Palestinians. This photo shows a mother being totally humiliated by Israeli border Police in front of her young children. This happens daily at various checkpoints set up on major roads. There is no reason for the police to cause such embarrassment, but they continue to do it because they can, no other reason. There was a suicide bombing earlier in Tel Aviv. At least 9 people were killed and many more injured. Does this mean that every Palestinian family on the roads throughout Israel has to be questioned and humiliated in front of their children? Can anyone think of a better way to perpetuate hatred towards the occupiers? It’s just another example of ‘In Your Face’. I know a young Palestinian man. He is a lawyer from one of the finest families I have ever met. His cousin was a member of the Israeli Parliament. The entire family is respected in both Israel and Palestine. He was recently married and like most newlyweds the couple headed off to their honeymoon. They planned to go to Italy, but when they arrived at the airport they were given a security check that Osama Bin Laden might get. As a result of this harrassment they missed their plane and had to leave a few days later (after purchasing new tickts as the original ones were no longer valid). Again, I ask, why was this done? Because they can is the only answer I can come up with. It’s time for things to change here. It’s time for Israel to accept the fact that there are two nations living here. It’s time for both sides to sit down and work out a just solution to the crisis we are facing here. We must do this WHILE WE CAN! 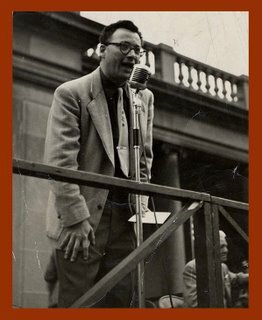 My Dad would have been 102 years old today. He left us way to early in life at age 62, but I think of him every day and miss him terribly. He was a great guy! I remember when I was a child, he was always cheated out of a birthday present because my parent’s anniversary was the 13th of April. There was usually enough pennies in my piggy bank to buy a present for that, so Dad was always ‘shortchanged’.. but he understood and never said a word about it. The following is a poem I wrote in honour of his 80th birthday.. I wanted to share it with you all….. When he was only sixty two. But instead he himself was caught. And enjoyed it as much as possible. Made life that much more meaningful to him. He asked for very little out of life. Never pretending to be something he wasn’t. And never let the system get him down. So sick that he could work no more. He died as he lived, quietly and with dignity. His feasts of fish or whatever. He was just that kind of a guy. Be assured that you are not forgotten. Will celebrate your eightieth birthday. Rest in peace in a world of peace.